Slow-moving Tropical Depression "Gordon" continues to bring heavy to excessive rains across portions of the lower Mississippi Valley. Moisture from Gordon will spread north into the Middle Mississippi Valley and interact with an existing frontal boundary on Friday, September 7, where several days of rain has already saturated the soils, increasing the potential for excessive rain and flash floods. Gordon will become extratropical by Saturday morning. Tropical Depression "Gordon" is forecast to move northeastward from parts of the Lower Mississippi Valley to the Middle Mississippi Valley by Saturday evening, September 8, NWS forecaster Ziegenfelder noted. The system will produce showers and thunderstorms over the Lower Mississippi Valley that will move northeastward to parts of the Ohio, Tennessee, and Middle Mississippi Valleys by Saturday evening. A front extending from the Mid-Atlantic to the Middle Mississippi Valley southwestward into the Southern Plains will be quasi-stationary with the eastern parts of the boundary moving southward into the Southern Mid-Atlantic by Saturday. The western end of the front will slowly move eastward to parts of the Lower Mississippi Valley/Western Gulf Coast also by Saturday evening. Showers and thunderstorms will develop along and near the front from the Mid-Atlantic to the Central/Southern Plains that will continue over the Mid-Atlantic into the Middle Mississippi Valley/Texas as well as Lower Mississippi Valley by Saturday evening into Sunday, September 9. In addition, tropical moisture over the Southeast and the Eastern Gulf Coast will aid in producing showers and thunderstorms over the region through Saturday evening. Meanwhile, a front just off the Pacific Northwest Coast will move onshore by Friday evening and move eastward to the Northern High Plains into parts of the Great Basin by Saturday evening into Sunday. Light rain will develop over parts of the Pacific Northwest Coast by Friday evening that will expand eastward into the Northern Intermountain Region by Saturday. The light rain will continue over parts of the Pacific Northwest through Saturday evening into Sunday. Showers and thunderstorms will develop over parts of the Northern High Plains/Northern Rockies on Saturday afternoon moving into parts of the Northern Plains by Saturday evening. The model below shows potential total accumulated rainfall produced by Tropical Depression "Gordon" and Tropical Cyclone "Florence." Regardless of Florence's eventual track, large swells will begin to affect Bermuda later today and portions of the U.S. East Coast this weekend, resulting in the life-threatening surf and rip currents, NWS warns. 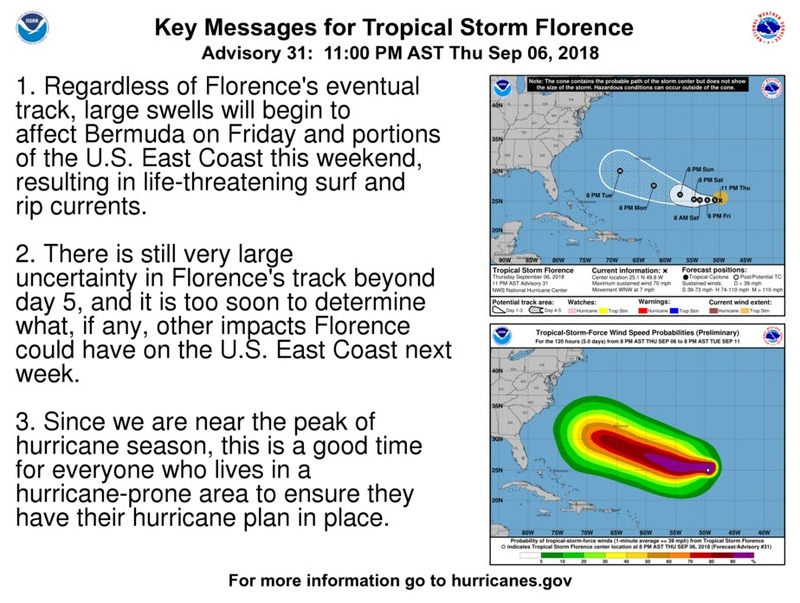 There is still very large uncertainty in Florence's track beyond September 12, and it is too soon to determine what, if any, other impacts Florence could have on the U.S. East Coast next week. Since we are near the peak of hurricane season, this is a good time for everyone who lives in a hurricane-prone area to ensure they have their hurricane plan in place.